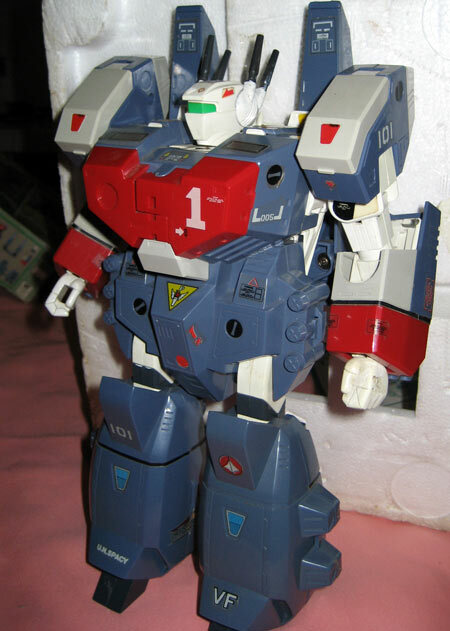 The story behind this was that I got a Macross VF-1S Strike Valkyrie from DYRL for Christmas 23 years ago. A day after that, my mom came up to me while I was playing with it and she told me that she couldn't wait any longer so she decided to give me the gift that was supposed to have been given on New Year's day. 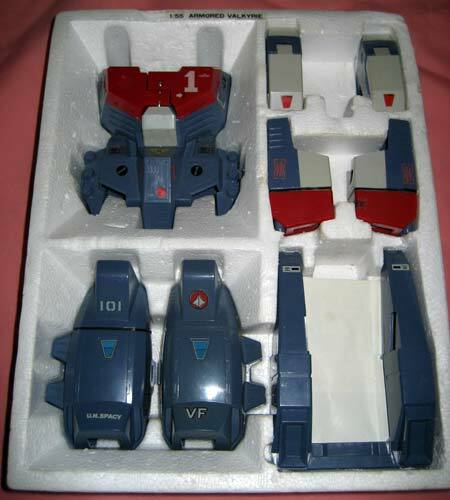 That gift was a GBP-1S Armored Valkyrie kit for my Strike Valkyrie. You could just imagine me leaping into my mother arms and smothering her with Thank You's and kisses. Hopefully my wife and I will also get the chance to do something that awesome to our son on his Christmas day. 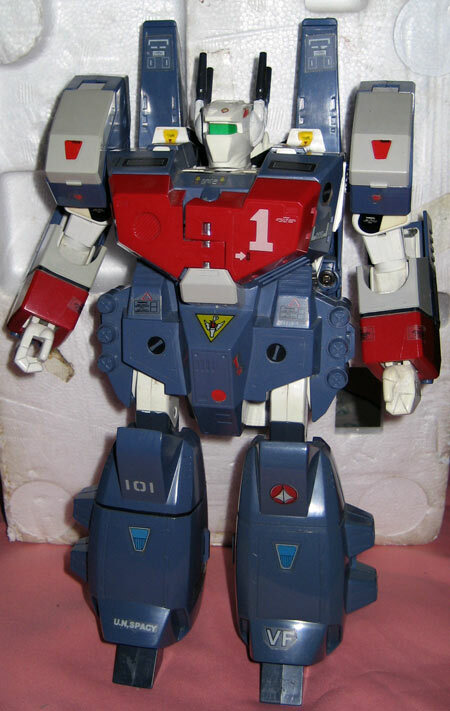 In the Macross TV series this armored pack first appeared in Episode 9, the very famous Miss Macross episode which Lynn Minmei won and that set her on the road to stardom and separation from Hikaru Ichijo. 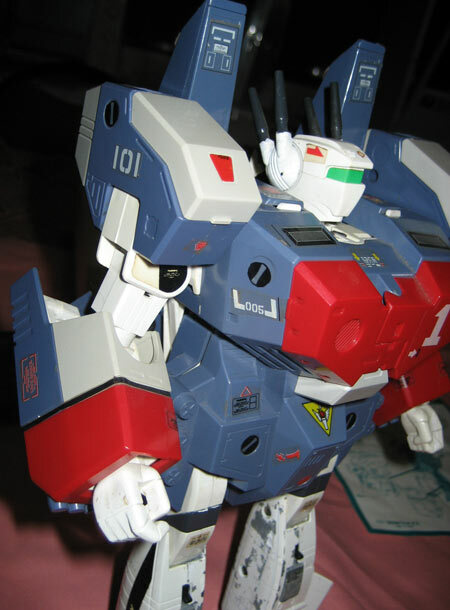 Hikaru was the flight officer in standby in case an attack came along during the Miss Macross Pageant. Of course the Zentradi had to come along so he was called away from watching the pageant. 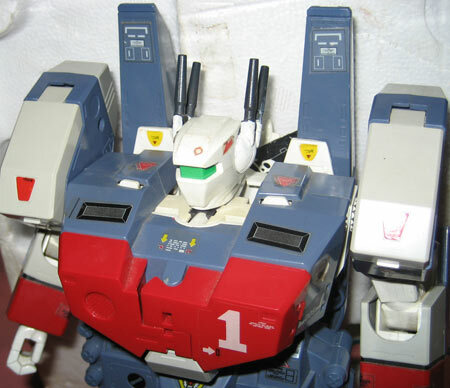 During that time he had the GBP-1S armor installed in his VF-1J when he went out to investigate. 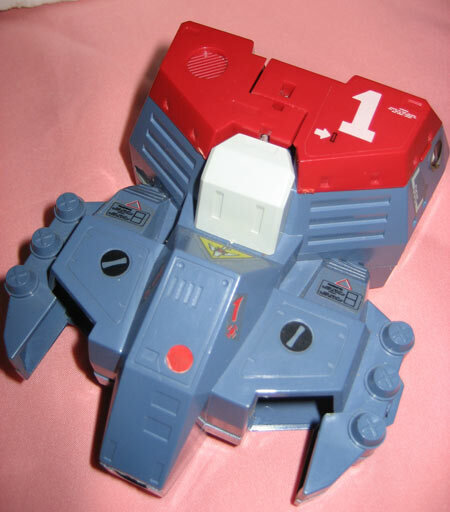 This however wasn't the first time that the Armored Pack appeared in the Macross timeline, as Roy Fokker wore an earlier version of this fighting DD Ivanov in Macross Zero. 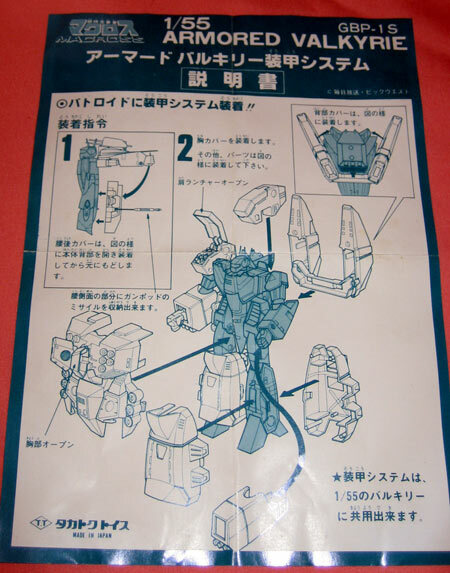 The more recent appearance of the Armored Pack was with the VF-25's of Macross Frontier. 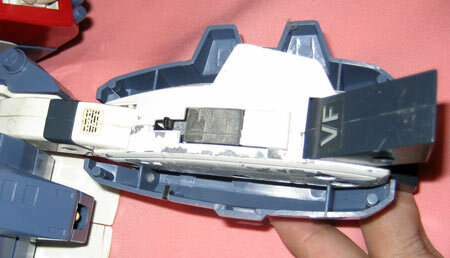 The difference being this time is that the VF doesn't have to be in Battloid mode in order to use it which was the limitation of the previous incarnations. Macross creators also seem to like to use the same color scheme for the Armored Pack of Blue, Grey and Red. Yamato Toys however released a realistic camouflaged version of the armored pack in their 1/48 scale series, one in urban camouflage, while another in jungle colors. 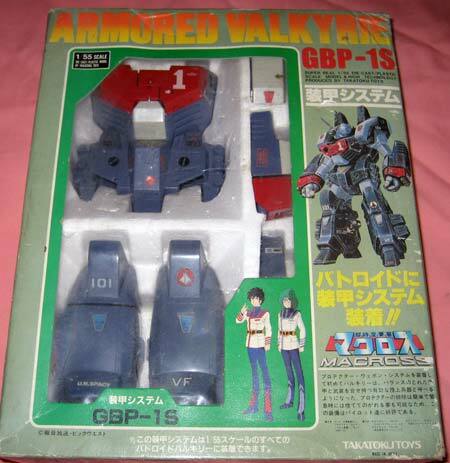 Box pictures, it basically says Armored Valkyrie GBP-1S Soukou (armored) System. Clear plastic to show what's inside. There's a photo of Hikarui Ichijo and Maximillian Jenius on the front cover. 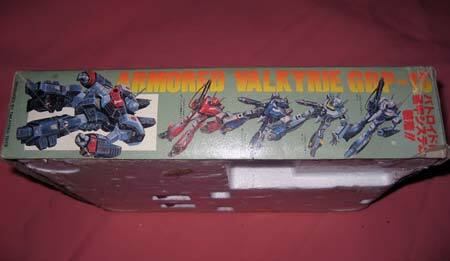 Some shots of the side of the box cover showcasing the other Macross Valkyries available in the series which can fit the Armored Pack. Removing the cover reveals the Styrofoam case. 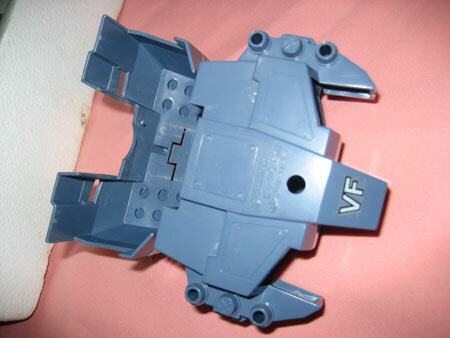 That label on the top, 1/55 Armored Valkyrie, doesn't really go there. I just stuck it there using the sticker sheet that came along with the case. 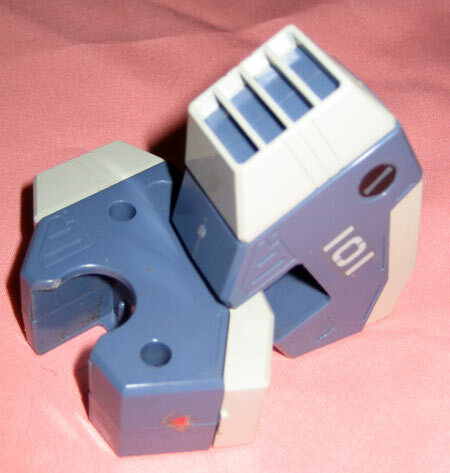 The torso piece can be split into two parts to facilitate wearing. 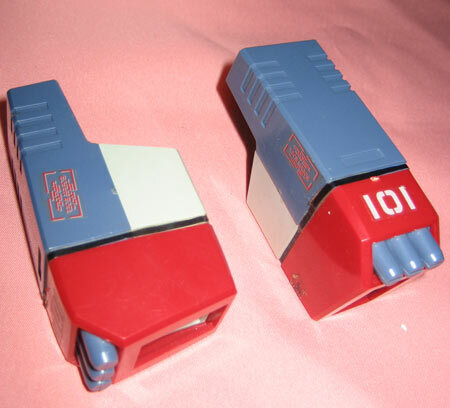 The front red panels open to display missiles. 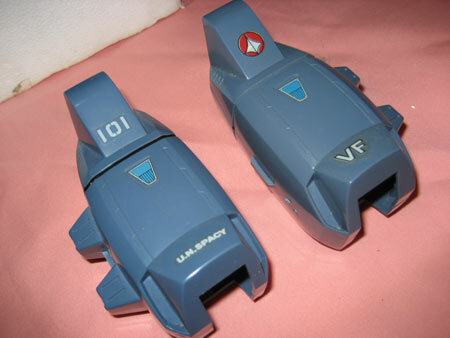 But the rendering of the missiles aren't as detailed as they are just molded into the piece. Back shot of the torso piece. 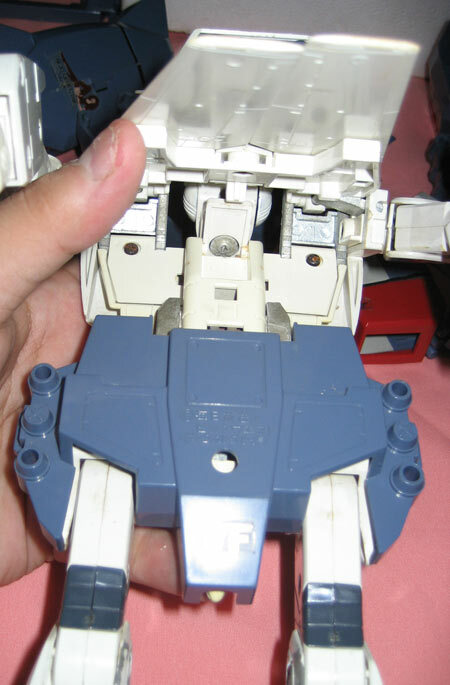 The 4 holes on the side of the armored pack allow the gunpod "Missiles" (as written in the manual) to be stored there. 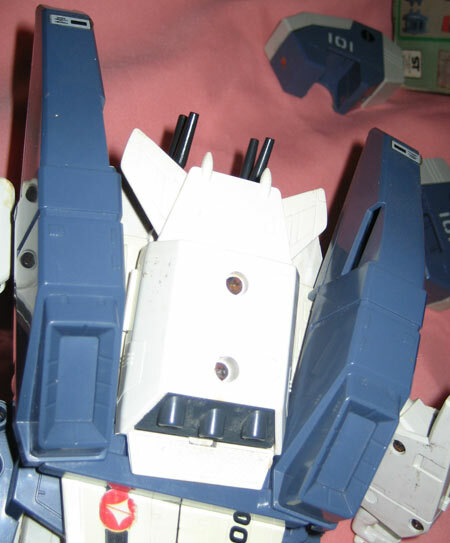 Yeah yeah its not really canonically correct because the gunpod doesn't fire missiles. 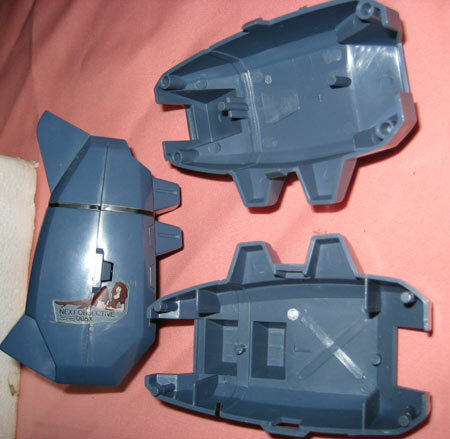 The 1/55 Valkyrie however originally built by Takatoku used a gunpod that could fire projectiles at its tip and was triggered by the magazine found in the gunpod toy. I wouldn't recommend storing "missiles" there also because they fall off easily. 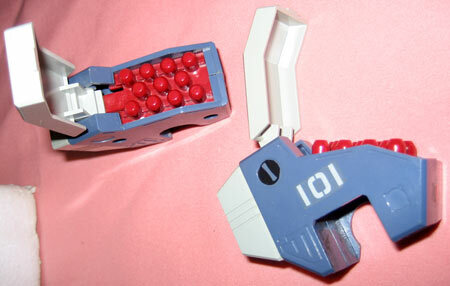 Here's the torso piece disassembled, two fasteners on each side is what keeps them together. 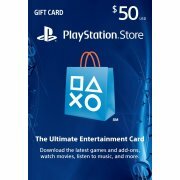 Here's the booster pack. 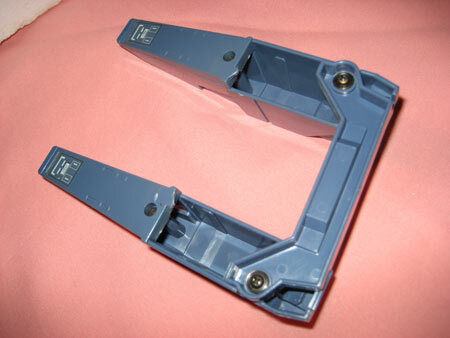 Unlike the strike and super pack armor, the GBP-1S is actually one piece that swivels to facilitate installation. It's held together by screws. The slits on the inner side is where the folded rudders of the Valkyrie go in to also help keep it in place. Nothing special happens here. Meaning no doors open to reveal missiles. Each leg armor is split into two pieces that wrap around the leg and is fastened by snap points on the side. The sticker sheet had a cute sticker of a girl that was meant for the inner leg on one side. 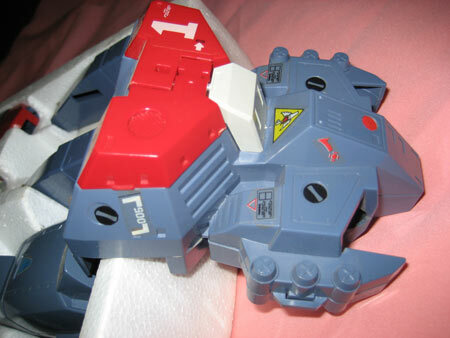 These things basically just fit in the arm of the Valkyrie then they snap in place. Then you can just pull it out to detach them. 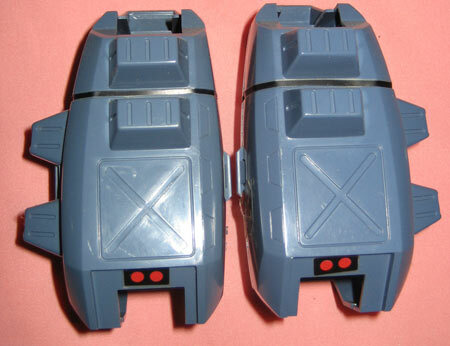 These two clip on to the shoulder joints of the Battloid. They open to reveal a sling of missiles. 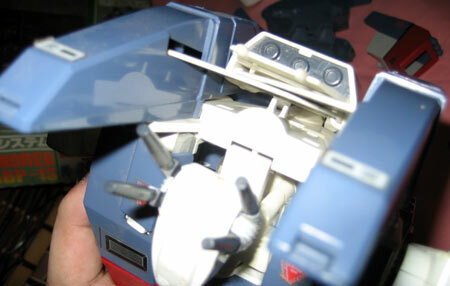 The detail of the rear includes exhaust ports for the combustion gases generated when the missiles are fired. When assembling the piece I usually start with the torso armor because it's the biggest piece and will be ungainly if you decide to install it in last. I put in the back part first then snap on the front piece. 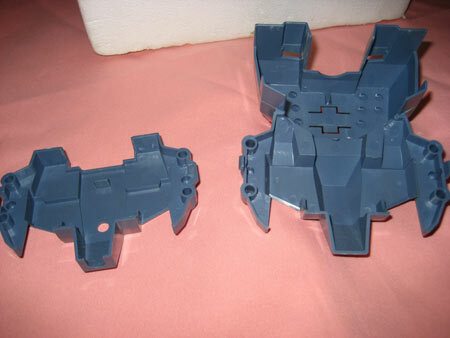 The two slits on the front part of the torso armor latch on to the two points of the chest armor of the Valkyrie, do this before snapping the back and front parts together. The booster pack is usually what comes next. 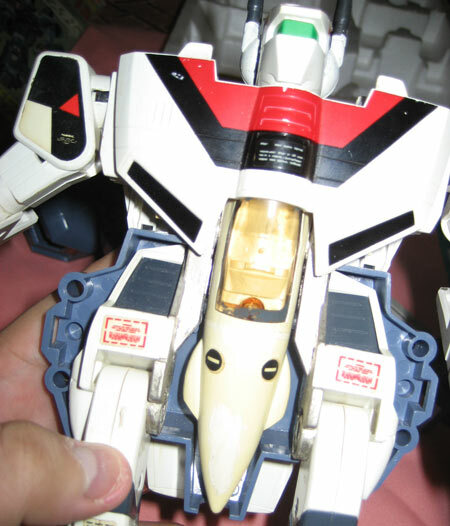 I slide the bottom bar underneath the Valkyrie's backpack jet unit then insert the two rudders into their respective slits in the booster pack. The booster pack should then snap on to the shoulders of the Valkyrie. 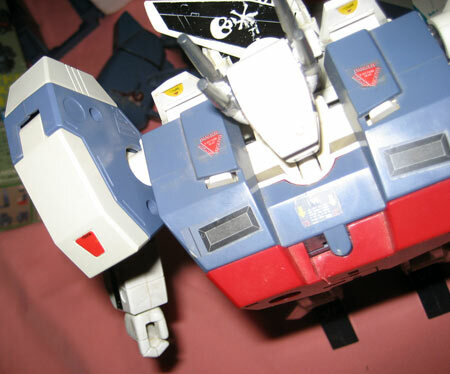 For the Shoulder Armor and Missile Pack, you just pop it in the shoulder joint till it snaps together. Arms are next, just slide it in till it snaps together again. 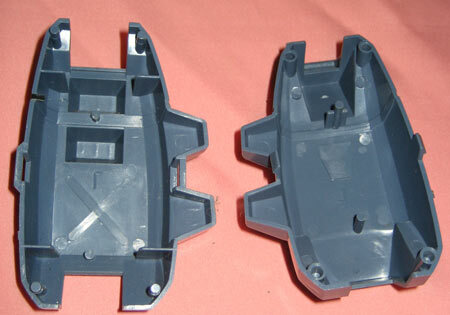 Then comes the leg armor which is basically the back part being placed behind the leg, then that and the front will be brought together till the two fasteners connect them. Here's some more shots of the completely assembled Armored Valkyrie. 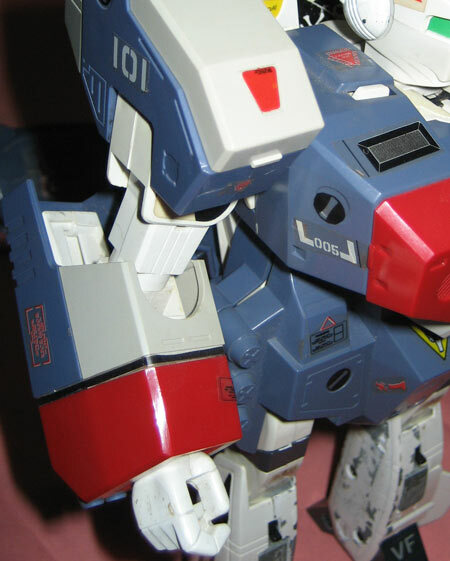 I guess if this version were placed along side the more recent offerings of Macross Toys by Yamato and Bandai, the 1/55 would fail miserably in terms of detail and quality. 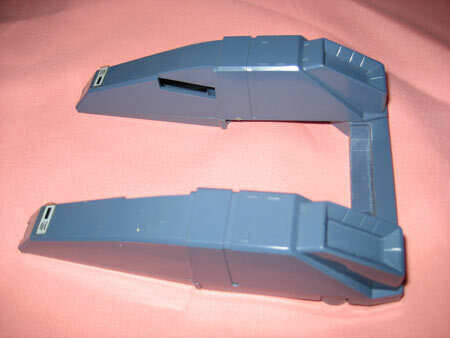 But during its time, in the early 80's, it was indeed a revolutionary toy. 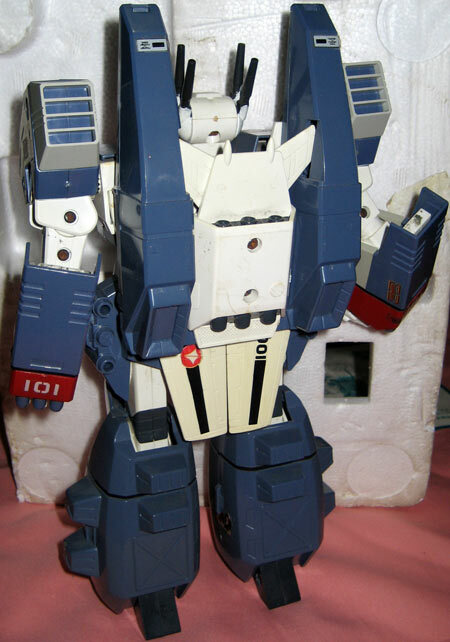 I remember being amazed with the amount of articulation it had and the fact that it was 3 toys in one. 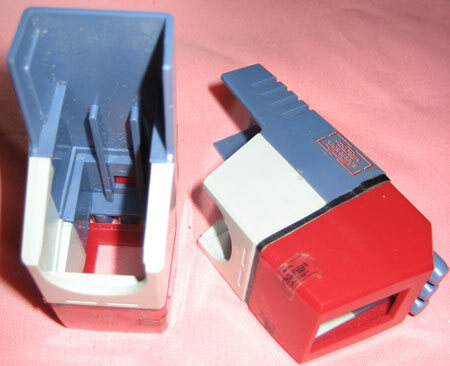 But I owe it to this toy for having given me a lot of Awesome childhood memories that I still carry to this day. 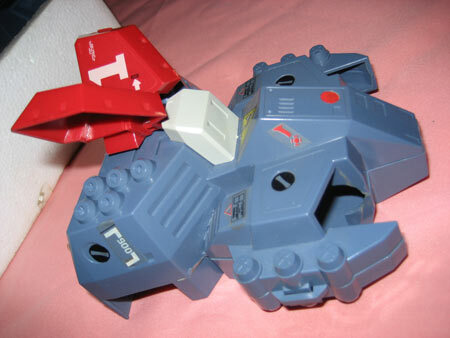 23 years ago sure seems like just yesterday whenever I see this toy. You can also check out the latest GBP-1S by Yamato for the 1/60 series of Valkyries.